"Ad-Aware 11 is Lavasoft’s next generation anti-malware product that includes behavior based heuristics, generic detection routines and virtual machine analysis for executable files that is capable of detecting zero-day and new/unknown malware. It has support for more than 100 packers and runs full multithreading and concurrent scans." Many security industry actors build solutions that lie in the perimeter of networks, inspecting traffic and discriminating potentially malicious content. One of these solutions is SIMBA from Saint Security (others include FireEye, Fidelis XPS, Damballa, etc.). As a cloud-based malicious codes database system, malwares.com is a one-stop service to collect, analyze and detect various malicious codes or malwares such as Trojans, Viruses, Worms so that customers or end-users can make proper security policies to take countermeasures against security threats. Welcome on board and thanks for joining us! Fast update and leave less open window for attack. Less false positive than other web filter DBs. Website hijacking prevention. Concise malicious URL database. Including: Drive-by-Downloads, BlackHat SEOFake Anti-Virus, Installer and Updates, Scarewares and etc. Welcome on board guys, thanks for joining VirusTotal! What is AutoShun? AutoShun is a small appliance that protects your network from attacks. Automatically updates itself within minutes to bidirectionally block new threats. One AutoShun device is able to protect an entire site. Configurable whitelist to ensure business partner communications. Ability to block traffic by geographic regions. Reporting on all blocked threats and traffic. This is the way the RiskAnalytics team describes its AutoShun solution. As you may infer, in order to be able to bidirectionally block threats, AutoShun works (among other technologies and logistics) with a dataset of online threats. From now onward VirusTotal users will also be able to check their submitted URLs against this dataset, which appears in VirusTotal under the name of AutoShun. SURF PROTECTION: If you unintentionally try to access a website that spreads trojans or spyware, Emsisoft Anti-Malware will prevent you from doing so. The built-in list of known dangerous and fraudulent websites is automatically updated every hour. The guys over at Emsisoft are committed to continue making the Internet a safer place, as of today, in addition to their file scanner, VirusTotal URL scan reports will also integrate their threat intelligence regarding malicious URLs. We are really grateful for the quick turnaround that the Emsisoft team has had in integrating their solution, thank you! Windows Sysinternals is a part of the Microsoft TechNet website which offers technical resources and utilities to manage, diagnose, troubleshoot, and monitor a Microsoft Windows environment. The Sysinternals collection includes awesome tools such as Process Explorer, AutoRuns or Sigcheck, among many others. I can still remember the times where I had to investigate remote e-banking user PCs in order to identify the culprit of a fraudulent transaction (Zbot, Sinowal, Ambler, etc. ), at the time, I do not know what I would have done without AutoRuns and ProcessExplorer. What I am trying to say is that at VirusTotal we are great fans of the Sysinternals utilities. It has been a while since we integrated Sigcheck in VirusTotal, providing extremely useful information about PE signatures, data that can be used in goodware vs. malicious scoring systems, to identify the author of a legitimate piece of software or to spot compromised certificates used in signing malware, just a couple of practical use cases. Thank you Mark! It has been a pleasure working together! PC Tools has been removed from VirusTotal as it has been retired from market. The PC Tools security portfolio was retired on May 18, 2013. StopBadware is a nonprofit anti-malware organization based in Cambridge, Massachusetts. Our work makes the Web safer through the prevention, mitigation, and remediation of badware websites. We protect people and organizations from becoming victims of viruses, spyware, scareware, and other badware. This is the way the StopBadware team describes itself, a pretty awesome initiative that has managed to bring together many partners. From now onward VirusTotal users will also be able to take advantage of their URL verdicts. Without doubt, this integration will bring great value to VirusTotal, thank you StopBadware! ThreatHive is a domain and IP reputation tracking system comprised of data collected from various sources including sandboxing , collecting data from various spampot systems and independent research. This is how The Malwarelab describes its ThreatHive initiative which has just been integrated in VirusTotal. With this inclusion we are well over the 40 URL scanners, over the weekend we have integrated some new engines that we will be announcing in the coming days. "CMC featured in house developed engine called Odin with static, dynamic unpackers, an x86 virtual machine to provide advanced de-obfuscation and in-memory engine to detect malware called Sonar. There is also a reputation based system named CMCRadar to accelerate response time, early warnings and global white listing." We welcome Bkav as a new engine working at VirusTotal. This scanner includes both signature based and cloud technologies. This vietnamese company, established in 1995, is also a smartphone manufacturer. In a nutshell, the AntiLogger is a lightweight app that keeps track of who is doing what on your computer. Instead of identifying malware based on its signature fingerprint, like all malware products with scan functionality, the AntiLogger catches malware at the moment it attacks your computer. It will then prompt you if an illegal program is trying to record your keystrokes, capture your screen, gain access to your clipboard, microphone and webcam, or inject itself into your computer’s sensitive areas.The AntiLogger features our unique SSL Intrusion Protection technology that guards you against advanced forms of Financial Malware. The AntiLogger is one of the very few products on the market today able to detect these dangerous and complex threats. Zemana AntiLogger is not designed to replace your installed antivirus software -- it's made to detect serious threats that are outside of their scope. It adds an extra layer of essential protection to whatever anti-malware or anti-virus software you're currently using. This information is particularly interesting as it characterizes behaviour in end-user physical machines, i.e. real-world scenarios, so it can overcome common problems with behavioural sandboxes such as virtual machine detection. But the metadata shared does not limit to this, as they are also providing interesting data such as the in the wild file names for certain malware, which can sometimes be a hint regarding the dissemination and propagation strategies used by attackers. Additionally, since Zemana is not designed to replace installed antivirus software but rather as a complementary security layer, they are very often able to detect zero-day malware with low detection rates, samples that they are actively sharing with VirusTotal in order to improve detection rates world-wide and help make the Internet a safer place. Thank you Zemana team! Keep up the good work! This information includes the content encryption object, the extended content encryption object and script command objects, if any at all. The Advanced Systems Format (ASF) is Microsoft’s proprietary audio/video container format, this specification defines the structure of the audio/video stream and provides a framework for digital rights management (DRM) of the contained streams. Files using such a format are commonly seen with wmv, wma or mp3 extensions. 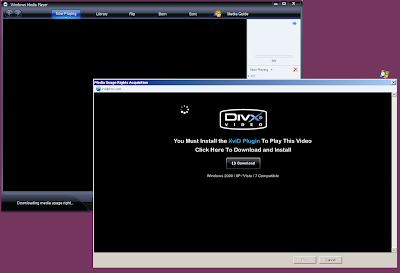 The Windows Media Rights Manager allows protection of the media content in such a way that once the user tries to play a file for which there is no valid license, Windows Media Player will display a URL defined by the content provider. This scheme allows attackers to create evil media files forcing visits to malicious URLs when the crafted file is opened. In the following screenshot we can observe how a wmv file (https://www.virustotal.com/en/file/9c3d364fb2f6e43a8c1d149bfb929bc5fc1ec2a9ae6ca424d87295e65b61e3c4/analysis/) forces the user to visit xvidprox.com, this site deceives the visitor making him think he has to download and install a “required” plugin in order to watch the video, a common social engineering trick. Needless to say, you will not be able to reproduce the video file (commonly they are small encrypted videos no bigger than 300k and padded with useless data to look like the latest 800MB movie release). We successfully tried these videos on Windows Media Player 11 and 12, no user iteration was needed to show the malicious websites, this leads to even more interesting automated exploitation through browser vulnerabilities. We can find a deeper analysis of this matter in a 2010 post at http://habrahabr.ru/post/89676/ (Russian). We believe displaying these new file details will further help malware researchers in their fight against the bad guys. Additionally, this attack trend leaves room for new interesting features to be implemented in VirusTotal with regards to the relationships between files. Was this file downloaded from a given site? And if so, was this site used in a media content DRM social engineering attack? Which video file was the initial trigger for the whole infection process? Interesting questions that we will soon be addressing. Xylitol has been extremely kind in letting us enrich VirusTotal's URL scanner with his CyberCrime tracker. CyberCrime is a C&C panel tracker, in other words, it lists the administration interfaces of certain in-the-wild botnets. As such, its URL database is inherently smaller than other datasets integrated in VirusTotal. Nonetheless, one should not neglect the usefulness of this tracker, very often other malware-related infrastructure will be located in the same host as the botnet administration panel, hence, it can prove itself very useful in finding evil. Thank you Xylitol! Keep up the good work! is to provide detailed infection statistics, C&C information and an automatically updated domain blocklist of various botnets to the security community. The site is non-profit and focuses on banking trojans and financial malware, some of the botnets they track are: multibanker, sinowal, tinybanker, urlzone, zeus, ramnit, etc. This is fantastic news for the average end-user, since they will have a better view of the most perilous threats directly targeting their money. Yet another URL scanner, one more and we will be in the forties, thank you Virus Tracker team! Last year we included sandbox execution reports for Portable Executable files thanks to the amazing tool developed by Claudio “nex” Guarnieri and his team, Cuckoo. 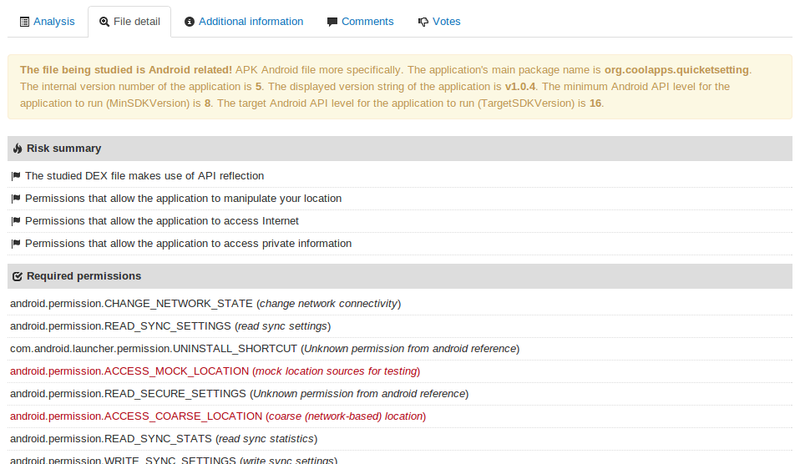 We are excited to announce that as of today we are also displaying behavioural reports for Android applications (APKs). Indeed, when informing you about Anthony's return from the Android jungle we promised there would be some further new and exciting features to come. While traversing a cascade of APK, ODEX, DEX, AXML and ARSC species he discovered that sometimes Androguard was not enough to distinguish the good from the evil, he needed something more, he needed to record how these species behaved in order to have a clearer picture in mind of their malicious or harmless intentions. Attending to these needs he developed an in-house Android Sandbox where these fancy creatures could play around, spit their SMS, excreate their files, sing melodic HTTP conversations and perform animal matters. Please note that these reports will appear in an asynchronous fashion, they may not be generated until a couple of minutes after your file scan ends. 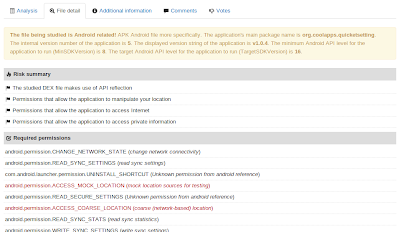 Those users with private API or allinfo privileges will see this information in the API responses. As to VirusTotal Intelligence, we will soon be indexing this data and the new Androguard outputs in order to enhance our search functionality, stay tuned, pay attention to the pertinent documentation. Our resident Android expert, Anthony Desnos, is back from the Android jungle once again. In this new trip he has encountered and documented many new wild specimens, fought a couple of battles against nasty creatures such as Smsilence and worked hard to polish his main weapon when confronting and recognizing the evil: Androguard. VirusTotal's private Androguard version has been noticeably improved and the information it dumps is far more extensive than it used to be, including a risk summary, permissions, permission-related api calls, activities, services, receivers, application certificate information and a very long etcetera. This new information appears under a new tab named file details, just as you can observe in the following screenshot. As usual, suggestions and feature requests are more than welcome! BA or BS degree (in a technical field preferred). At least 1 year of full-time relevant work experience. Ability to quickly learn new tools, technologies and concepts; Interests in the Internet/ICT security field, more specifically malware and antivirus. Ability to effectively communicate and collaborate with a diverse range of people and job functions. Excellent communication and presentation skills, both written and verbal in English (Spanish and other languages will be a plus). Preferable: technical background in order to code (python language) new product features with the engineering team when idle on support and sales operations. Preferable: ICT security, Reverse engineering and malware research knowledge or passion to learn about these fields. Preferable: cooking skills (big kitchen here), D&D, video-games and sports. First level support to VirusTotal users. Troubleshoot and solve user issues (mainly via email, very occasionally on the phone). Relationship management (VT Community, users, researchers, discussion lists, security groups, forums, conferences). Collect customer and user feedback, classify it, prioritize it and make it available to the engineering team. Define user needs to improve services. Develop and provide custom presentations about VirusTotal services. Demonstrate service usage and basic technical use cases (API integration, Intelligence investigations, etc.). Manage a varied portfolio of customers at scale. Manage the entire sales cycle (finance and legal tools) and customer billing working closely with the Finance, Legal and VirusTotal team. Formulate legal language and agreements for new services being developed by the engineering team. Come up with design ideas and improvements for existing services. If you are interested, please send us an email to contact at virustotal.com (subject: "tech-vendor-support job offer") and don't forget to attach your CV.